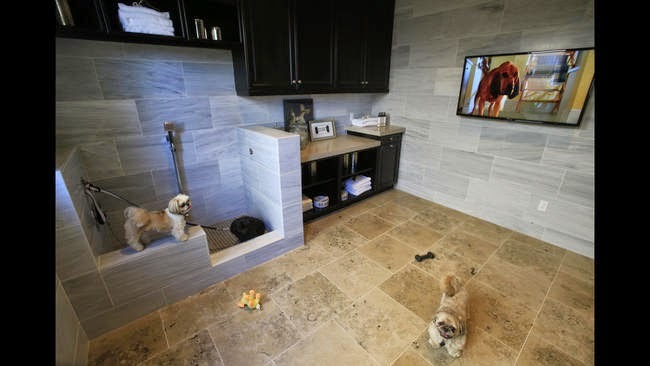 Standard Pacific, a California-based home builder, has begun to sell homes that include an option of adding a pet suite that is especially designed for your family pet. These suites are being offered in 27 of its 190 developments nationwide. Jeffrey Lake, Vice President and National Director of architecture says "Devotion to pets is second-to-none...they are family"
The selected Standard Pacific homes have an optional 170-square-foot "pet suite." These suites include everything from a tiled washing station with leash tie-downs, a hand-held sprayer, and a pet dryer. It also includes a water station; automated feeders; a large bunk-style bed; cabinets (for toys, treats and food); a stackable washer and dryer; a French door that opens to a puppy run; and a flat-screen TV. There is also no need to worry about resale value, it is designed to be easily converted to a functioning room. Danielle Tocco, a spokeswoman for Standard Pacific, recently told the Los Angeles Times, that the "prices are beginning at $1,500, but are typically around $8,000 or more" The Avignon community, in California, features the largest plan and can add up to $35,000 to the home price.